I love to eat meat. I am not saying that I am a carnivorous but I always need one meat dish for lunch/dinner. If I don’t have a meat dish for my main meals, I won’t feel satisfied or so called satiety feeling. I love pork, especially pork belly. There are so many variations to a pork dish, stir-fry, roast, braised, slow cook, etc. Without a doubt, I loved any style of a pork dish. This dish below is a slow-cook pork belly. It’s called dong po rou in Chinese. It’s so yummy. Because it’s slow cooked/braised, the pork became so tender. It just falls off. YUMO. I came across the recipe from a really good blog called Rasa Malaysia. A very informative and interesting blog with over 400 recipes! The recipe calls for the use of a clay pot, dutch oven or stainless steel pot but I don’t have any of that. So I just use a normal pot/saucepan. I think it still do wonders. However, I think making this in a clay pot will be amazing because it will caramelised the sugars on the skin of the pork even more! You can check out the original recipe here but below is my version of it. 1) Bring a pot of water (large enough to fit the pork) to boil. Add the pork belly and boil for 5 minutes. 2) Discard water, remove pork from pot, rinse and pat dry. 3) Cut meat into 4×4 cm pieces. Tie each piece with food strings as tight as possible to avoid meat from falling apart while braising. 4) Heat up the pot (you can use the same one as earlier when boiling) with oil, stir-fry ginger and spring onions until aromatic. Pour in the water and continue boiling for 10 minutes. 5) Add light soy sauce, dark soy sauce and wine and boil on high heat. 6) Mix in brown sugar and pork pieces, skin side down first and cook for 5 minutes. 7) Lower the heat to medium-low or at a gentle simmering level, cover the pot and braise pork for 30 minutes. 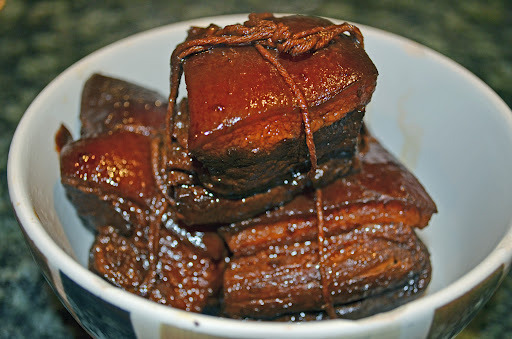 8) Turn pork skin side ‘up’ and continue braising for 1 1/2 – 2 hours, or until pork is tender enough to your liking. 9) Serve pork with some of the reduced sauce over steamed rice and vegetables. Do not feel intimidated to make this because of the long cooking time. It is really easy to make, I promise. You can just leave it to braise and do other things. It is definitely worth the effort if you love pork belly.